"Schulman may just be the best Valjean of them all." These are some of the praises the critics are "singing" about Craig Schulman. He is the only artist in the U.S. to have performed the coveted leading roles in both The Phantom of the Opera and Les Misérables. He is widely recognized from his appearances on The Rosie O'Donnell Show, and on PBS in The Tenth Anniversary: Les Misérables in Concert. 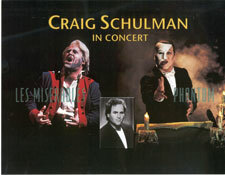 A highly regarded Pops artist, Schulman presents his solo concert program, Craig Schulman On Broadway. Included are selections from The Phantom of the Opera, Les Misérables, Fiddler on the Roof, Guys and Dolls, and many more. Featuring some of his own new arrangements, this will be a full-evening program, includes orchestral and vocal selections for your orchestra. He has also developed a symphonic half-program, comprised of Broadway "suggested" selections, which could be suitable for the first half of your concert evening. A performer with proven audience appeal, he is well known to the Symphony community. While Mr. Schulman is the producer of the highly successful Broadway Nights™ concert series, he is also available as a soloist for your own Pops programming, benefit, or corporate event. With his unique producing and artistic experience, he can help you cast and plan a highly successful "evening at the Pops." Schulman has appeared with orchestras, at corporate events and benefits in the following cities: Akron, Amarillo, Baton Rouge, Beaumont, Boca Pops, Fort Smith, Greenwich, Guam, Irving, Jacksonville, Kalamazoo, L.I. Philharmonic, Memphis, Milwaukee, New York, Oklahoma City, Philadelphia, Phoenix, Pittsburgh, Rochester, Salt lake City, Santiago, Spartanburg, Stamford, Syracuse, Tulsa, Wichita Falls, Youngstown, and more. Click on the "Contact" link below for booking information. "Schulman came close to stealing the show. His talent was the most encompassing. No wonder the Utah symphony gave him a second appearance. This entertainer stylized every note and word to bring his delivery to life." "Schulman...truly has a golden voice..."
"His voice...is one of the glories of this production." ". . . but then Schulman appeared, and his full bodied singing seemed to galvanize everyone else's." "Craig Schulman's acting is as good as his singing—and that is quite wonderful in the title role." "He sings with controlled ardor, with unusual refinement and power..."
"[His] beautiful voice makes the music of the night that much sweeter..."